An expansive border security bill declared a priority by Gov. Greg Abbott was given final approval Tuesday by the Texas Senate. The vote marked the near end of a months-long disagreement between the House and the Senate. *Editor's note: This story has been updated to reflect the bill's final passage on third reading. An expansive border security bill declared a priority by Gov. Greg Abbott was passed Tuesday by the Texas Senate. The vote marked the end of a months-long disagreement between the House and the Senate on issues like how to staff and spend on border security, and in what capacity to keep the Texas National Guard in the Rio Grande Valley to assist in border security operations. The bill, House Bill 11 by state Rep. Dennis Bonnen, R-Angleton, will cost about $310 million for the 2016-17 biennium — part of a sweeping, $800 million border security budget lawmakers are set to approve in the waning days of the legislative session. “The will of the people of Texas is to provide for their safety, and that’s what we’re doing with this bill” and with the budget spending, said state Sen. Brian Birdwell, R-Granbury, the upper chamber’s sponsor of the bill. The Texas National Guard was deployed last year to assist the Department of Public Safety (DPS) in its Operation Strong Safety, a surge of troopers dispatched in response to the tens of thousands of undocumented Central American immigrants entering Texas across its southern border. The final version of the bill maintains the so-called border surge of law enforcement officials in the Rio Grande Valley and requires that the Texas National Guard remain there until DPS hires and trains hundreds of troopers who will stay in the area permanently. There is nothing in the bill that specifies how long that will take or how much it will cost; that decision would be made on a case-by-case basis by the governor. "Gov. Abbott will retain discretion and funding to keep National Guard members in place on the border until DPS can replace their capabilities with both additional troopers and observation technology," Birdwell said. 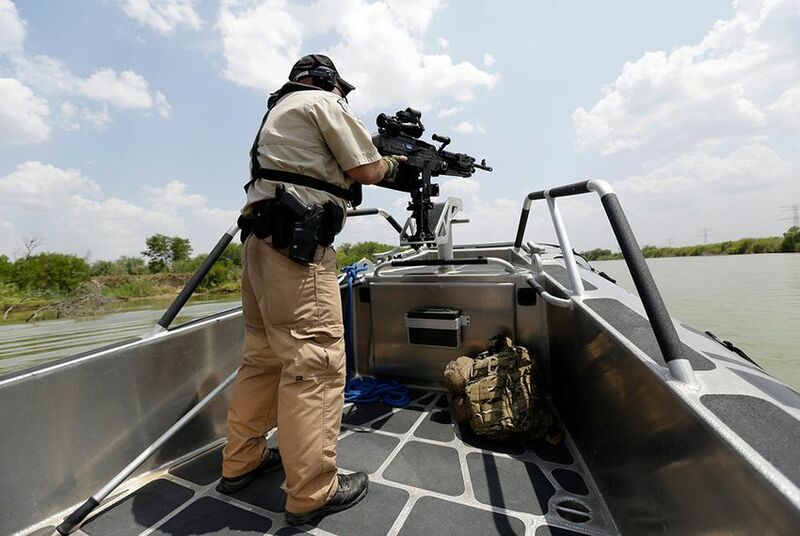 The border security measure initially passed the Senate 27 to 4 on Tuesday after Democrats aired their concerns that the bill would increase the "militarization of the border." It later passed finally on third reading. "It seems like we are treating the border like a foreign country," said state Sen. José Rodríguez, D-El Paso, who has been critical of the millions of dollars appropriated for border security. Facilitate the hiring of additional troopers, give DPS the authority to hire certain military veterans who have been honorably discharged, and credit peace officers from other law enforcement agencies with four years of experience when they join DPS, in addition to paying them at a higher rate. Create a transnational intelligence center on the border to analyze crime data, and establish a reserve corps of retired DPS officers to assist with background checks and other duties. Create a new offense for smuggling if a person knowingly transports or harbors someone in the country illegally — and does so for a profit. Require DPS to implement a strategy to establish southbound checkpoints on international bridges to search for weapons and bulk cash. The agency would work with federal authorities and share the costs of the operations. The current version of the bill also includes a Senate-added provision that allows DPS to implement a 50-hour work week for troopers statewide. The House measure initially only had that stipulation for troopers on the border. Meanwhile, senators stripped from the bill a House provision that would have created an oversight committee to monitor DPS spending and activities. DPS and its activities on the border have come under heavy scrutiny from border Democrats who allege the agency is unable — or unwilling — to provide statistics on how the state’s police force is performing. But Birdwell did add an amendment to create a joint committee on border security that will be made up of five members from each chamber. The committee will study border security in general, which Democrats said wasn't specific enough. State Sen. Carlos Uresti, D-San Antonio, tried to amend the measure to include a DPS reporting requirement. That amendment failed and Birdwell said he didn't want to expand the bill beyond what had already been agreed to by the House and Senate sponsors.